But if you don’t, or if you just don’t want to bother with stringing wires all over the room and hanging lots of boxes on the wall, you should give a careful listen to a sound bar. Who makes better sound bars: TV manufacturers or audio companies? 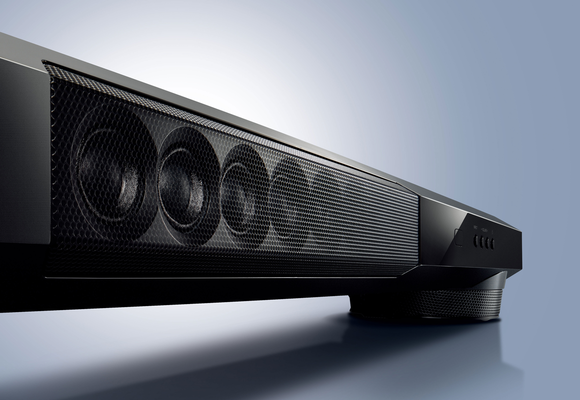 We put 6 sound bars to the test to find out. A sound bar is a speaker enclosure that’s designed to sit in front of (or underneath) your TV. If your TV is a wall-hanger, many sound bars come with mounting kits so you can hang the speaker cabinet right below it. Virtually every audio company—and just about every TV manufacturer—offers one these days. This Yamaha YSP-1400 ($450) boasts an integrated subwoofer. Despite the “sound bar” name, they actually come in in a variety of shapes, sizes, and types. Prices vary wildly from $100 to the thousands, as do the features they offer: faux surround, real surround, HDMI inputs, digital and analog audio inputs, USB ports, Bluetooth support, subwoofers, and more. Choosing exactly the right one for your needs isn’t a no brainer; but don’t worry, we’ll explain all the factors you should consider when you go shopping. Okay, this might seem obvious, but make sure you know how much room you have for your sound bar. This is super important if your TV is in an enclosure; otherwise, it’s simply a matter of aesthetics. A sound bar that’s narrower than your TV is one thing, but one that sticks out beyond the TV’s bezel will look odd. If you care more about looks than about sound, stick with a sound bar that’s made by the same company that built your TV. 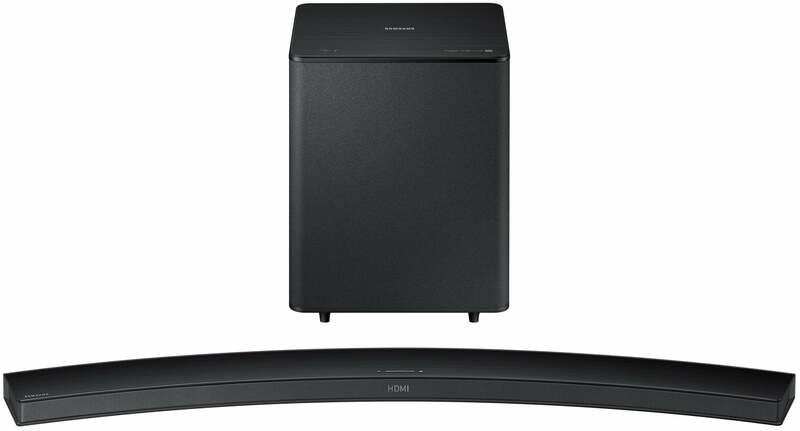 Samsung’s HW-H7500/ZA ($700) sound bar, for example, is designed specifically to match the flow of its curved TVs. This is a good solution if you want your audio solution to be heard and not seen; just bear in mind that TV builders don’t always produce the best audio products. Samsung's $700 HW-H7500/ZA sound bar is designed to mirror the curved form factor of some of Samsung's new TVs. 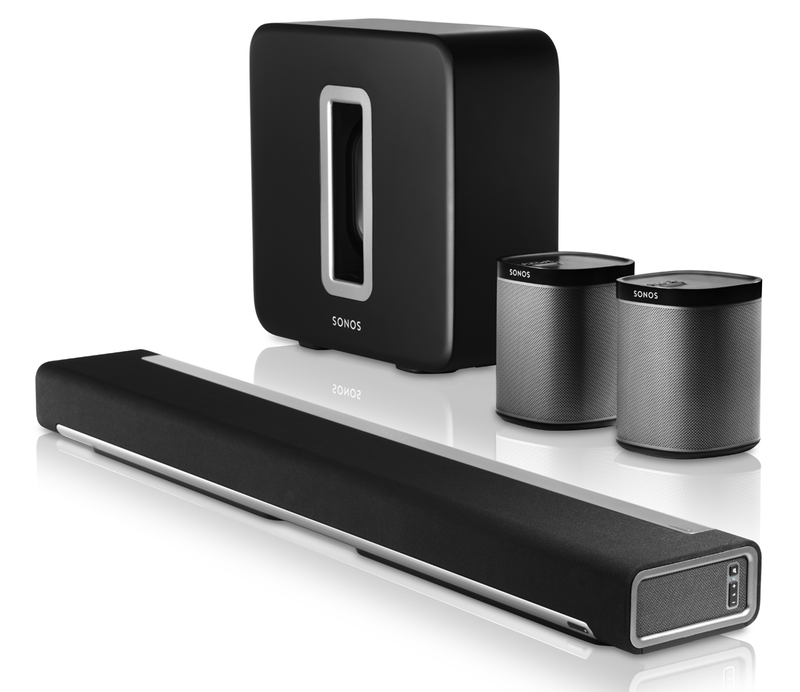 Another option is to buy a pedestal-style sound bar, such as the Zvox Soundbase series (prices range from $180 to $700). These speakers sit on your furniture underneath your TV. Not only do you not need to worry about the height of the cabinet impinging on your view of the screen, the larger volume of air inside the speaker cabinet allows lower frequencies to resonate better. In other words, they produce more bass, so you don’t need a separate subwoofer (more on this later). 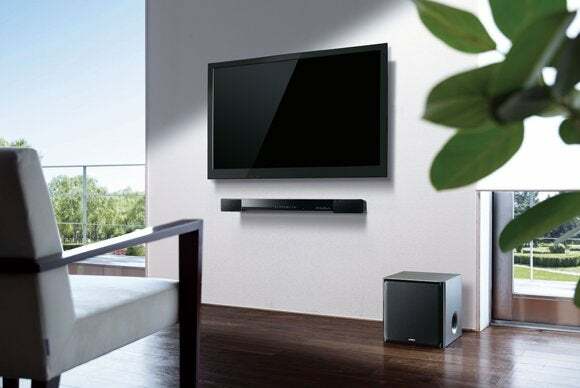 If you decide to shop for a pedestal-style sound bar, make sure it’s wide enough to accommodate your TV’s stand, and that it’s sturdy enough to support your TV’s weight. One last bit of prep before you hit the store: Snap a couple of photos of your TV and its surrounding environment with your smartphone. When you’re in the showroom evaluating candidates, pull it out so you can get a good idea of what the speaker will look like in your home. 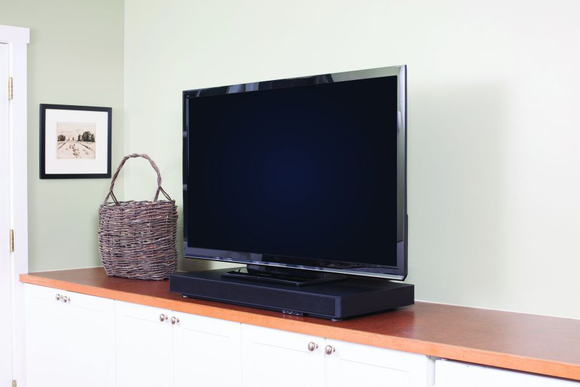 A pedestal-style sound bar, such as this Zevox Audio SoundBase 770, can be placed beneath a TV. If you settle on the conventional sound bar form factor over the pedestal type, you should consider buying one that comes with a subwoofer (unless the sound bar has one built in). The small speakers that can fit inside a sound bar just aren’t capable of reproducing the low-frequency effects in modern movie soundtracks that give you that rumble and shake feel you get in the movie theater. 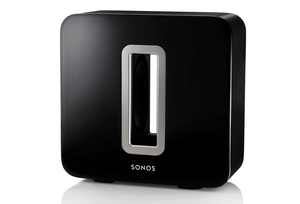 The Sonos Sub puts out big sound, but it's compatible only with other Sonos speakers. Now this will mean you’ll need to accommodate what could be a large, boxy, and somewhat conventional-looking speaker, but you won’t regret adding a subwoofer to your audio configuration. And since low-frequency effects are non-directional—meaning it will be difficult for your ear to locate where the bass is coming from—you can plop a subwoofer behind a plant or even behind a piece of furniture. You’ll need an AC cord to power it, but most subs make wireless connections to the sound bar. If you’re a considerate apartment dweller (headphones anyone?) or just don’t like sub woofers, you can often increase the amount of bass produced by a conventional sound bar by “coupling” it with a denser object, such as a wood cabinet. Remember the first time you heard a tuning fork placed against a wall or other solid object? Same deal, except with low-frequencies. If you see a sound bar touting its surround-sound capabilities, it’s likely simulated surround. Less-expensive speakers use psychoacoustic techniques designed to fool your brain into hearing things that aren’t actually present in the audio stream. Fire up Windows Media Player and turn on SRS Wow and TruBass to see what we mean. Faux surround can add a sense of stereo depth or spaciousness, but the quality varies between brands and don’t for a second think that it will sound like true surround. That’s not to say you can’t get true surround sound out of a soundbar. Higher-end products like the wireless Sonos Playbar ($699) can be linked to other wireless Sonos speakers (such as a pair of the $199Play:1s and the $699Sub) to create a genuine 5.1-channel home-theater audio system. Samsung’s HW-H750 is another example of a sound bar that can be paired with wireless surround speakers. You can assemble an awesome 5.1-channel surround-sound system using wireless Sonos components, but it will cost you. The higher-end models in Yamaha’s YSP-series (the acronym stands for Yamaha Sound Projector) can do almost magical things with sound by analyzing your room’s acoustics and figuring out how to delay some audio signals and bounce sound waves off the walls to fool your ear into thinking sounds are originating all around you. But the prices for these alternatives—the Sonos system described above costs $1796, and Yamaha’s best sound projector (model number YSP-4300) costs $1900—will be beyond some people’s budgets. Some sound bars come with a wide variety of inputs and outputs: HDMI, RCA, TOSLink, USB, and more. 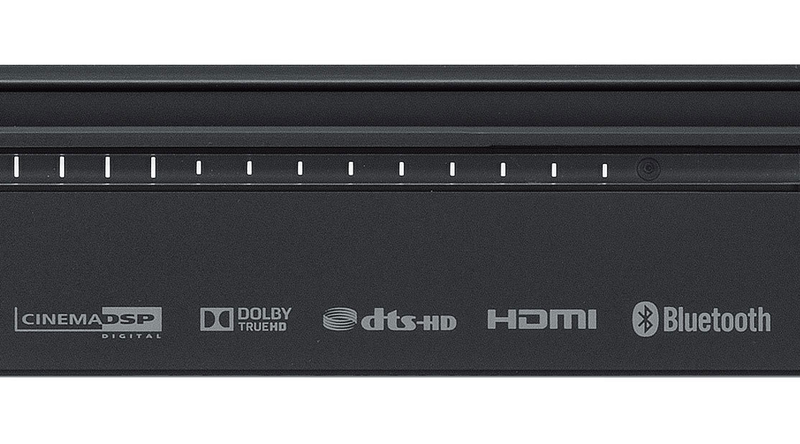 If you want to connect a Blu-ray player, a set-top box, and a video-game console, for instance, you’ll want a sound bar that has multiple HDMI inputs to accommodate all those sources. Make sure the sound bar you choose has all the inputs you'll need. Now you could use a TOSLink optical connection for one of those sources, but you should be aware that it doesn’t have the chops to handle the lossless surround sound that a Blu-ray player is capable of streaming. If you want to hear a disc’s Dolby TrueHD or DTS-HD Master Audio soundtrack, you’ll need a sound bar that can handle those codecs and you must use an HDMI cable. RCA analog inputs are handy if you’re using a stereo receiver or an older TV to drive the sound bar, but an 1/8-inch stereo input will work the same way (and RCA-to-1/8-inch stereo cables are cheap). The more inputs your sound bar has, the merrier. Just don’t pay for connections you don’t need. Sound bars needn’t be restricted to playing movie soundtracks. Many of the can also be used for stereo playback. The Sonos speaker mentioned above relies on its own wireless network, but many other systems—including the Samsung—can take audio streams from your smartphone or tablet, thanks to Bluetooth. 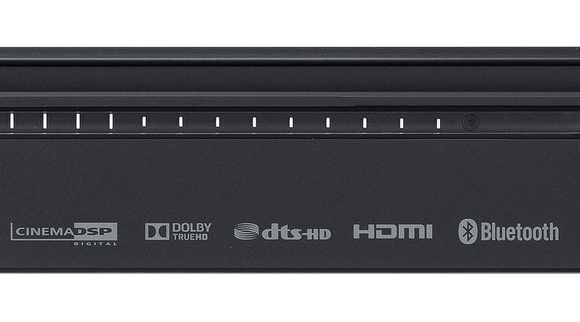 Many sound bars support Bluetooth connectivity, but support for Dolby True HD and DTS-HD Master Audio is more difficult to find. A Bluetooth connection to your sound bar is uber-convenient. Pull out your phone, press a button on the sound bar or its remote to activate Bluetooth input, and voila! The music that was emanating from your phone is now pouring out of your sound bar. Many sound bars also have an aux input that can do the same thing using your device’s headphone jack. That’s not as convenient as a wireless connection, but it will deliver much higher audio fidelity. We’ve put prices tags next to the products we’ve mentioned by name, so you’ve seen the wide range of prices you’ll encounter in the market. We’ve heard good sound bars that sell for less than $300, and we’ve heard speakers costing $800 or more than you couldn’t pay us to listen to. That’s hardly the ceiling on prices, but we’ve found the sweet spot to be in the $300 to $500 range for a sound bar with a wireless subwoofer. More expensive models might sound even better, but you’ll reach the point of diminishing returns quickly. And if you’re working with that kind of budget, you probably don’t to read this guide anyway. Editor's note: This story was originally published on 11/27/13. It was updated in its entirety on 12/19/2014 to add new and updated information.